Before the brand goes on! This has been the foundation philosophy of the Stucky Ranch since its beginnings in 1937. Gordon and his family have prided themselves on producing cattle that offer the best combination of calving ease and top performance, with maternal efficiency. They are committed to producing a product that will yield an outstanding eating experience for the consumer. Currently 250 cows are calved on the Stucky Ranch each year, with over 200 additional calves born at cooperator herds annually. Heavy emphasis is put on moderate frame, sound, functional females that are reproductively efficient. These females serve as the factories for the high quality, genetically superior bulls, that will work for the commercial cattlemen. Bulls as well must be functional, efficient and sound, combine visual and genetic performance, and be able to increase your profitability. To accomplish all this, the Stucky's have put a strong emphasis on performance data and genetic selection, and offers one of the most complete individual data keeping systems in the industry. Ultrasound scan data and performance measurements are available on every calf, only high accuracy herdsires are used, and extensive information on dams' body condition score, udder score, disposition are collected. Selecting for a balance of traits is a top priority. Embryo transfer is also used extensively to propagate elite genetics and produce consistency within the herd. The result has been elite foundation females like Circle S Eisa Erica 6073. 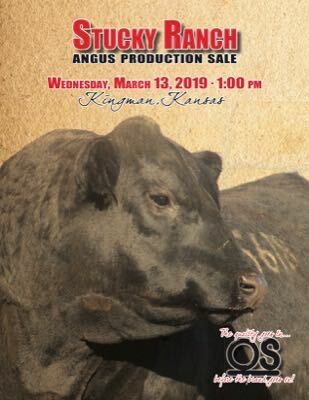 This "ranch icon" cow currently has over 125 progeny on record with American Angus, and has helped mold the future with superior maternal quality, balanced performance, and superior end-product quality. The Stucky's welcome all inquiries and extend a warm invitation to the ranch anytime. We are committed to our customers, our cattle, the consumer, and the Angus breed.